In the last week or so the EURUSD has met resistance at 1.15 and been sold off again as it maintains it trading range between 1.13 and 1.15. Only a couple of weeks ago the EURUSD enjoyed rock solid support from the key 1.13 level and subsequently surged higher back towards 1.15. Several weeks ago it did hit a three month high near 1.1570 before being sold off. 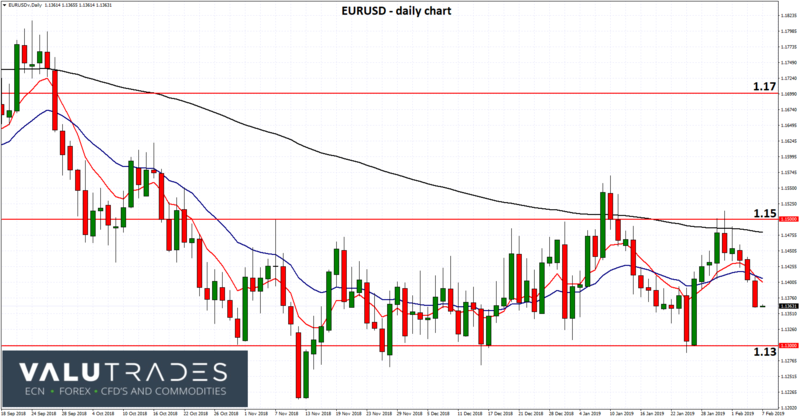 For the last few months now the EURUSD has been content to trade within a narrow range enjoying support from 1.13 and meeting resistance at the 1.15 level. The President of the European Central Bank (ECB) Mario Draghi is due to leave his office later this year on 31st October, and some unnamed sources from within the ECB have hinted at a problem in providing forward guidance on rates. The markets have pushed back their expectations for when the ECB will raise rates for the first time since 2011, to around mid-2020 at the earliest, well after Draghi leaves office in October. However there is a perception that if any ECB officials offer rate guidance this year, the incoming ECB President may be obliged to stick with them. Therefore some ECB policymakers are reluctant to alter their guidance on interest rates this year. “Not knowing who is the next president is very much the reason for our hesitation,” one of the sources, all of whom asked not to be named, told Reuters. “Normally it wouldn’t be an issue but Draghi is such a powerful personality, it becomes quite difficult to commit beyond his term.” Draghi’s successor is likely to be named only after the European elections in late May and the front-runners are Bundesbank president Jens Weidmann and French central bank chief Francois Villeroy de Galhau.